Q. What's the range of tiles available? A. At present Mototile offers three PVC tile ranges - Seamless, MotoMat & MotoLock. Mototile Seamless -Designed for creating floor patterns with a great selection of colours in two face patterns, Cointop and Diamond plate. 333 x333 x 7mm. Mototile Seamless tiles are available in the colours below. MotoMat For maximum economy and suitable for outdoor use. Cointop and Diamond plate patterns. Dimensions: 470 x 470 x 12mm. Materials: recycled PVC materials black tiles. Can be used outdoors. MotoLock - Heavy Duty, hard wearing PVC tiles suitable for forklift operations, workshops, retail flooring and similar indoor uses. Diamond-plate pattern. Dimensions 495 x 495 x 7mm. Materials: New PVC or recycled PVC in black or grey. MotoLock Heavy Duty tile colour range. Q. Can the tiles be custom coloured eg. to match my car? Q. Can I use the skirting and inserts from the Seamless range with Motolock or Motomat? Yes, although they won’t be an identical colour match - like they are for the Seamless range. Phone us for a sample. Q. Can I use the Seamless range in a workshop or industrial warehouse? The Seamless range is designed for creating show floors and floors subject to normal domestic uses. 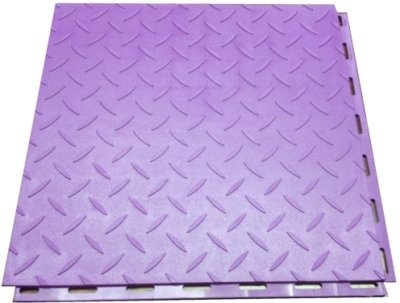 Motolock heavy duty tiles are best used here, being designed for industrial applications and floors subject to high compression loads. Q. How do you quote / measure tile dimensions? We quote Motolock and Motomat tile requirements based on an inside edge to outside edge measurement. We have found that this improves estimating accuracy. Other dimensions, which take account of 1) all tabs and 2) no tabs, are also shown below. Quoted dimensions for Mototile Seamless tiles are based on exact width (333 x 333 mm) because of their flush fit design. A. That depends on the choice of tile and colour, the Seamless tile range from £2.99 - 3.35 each, including vat. MotoMat Recycled tiles are the lowest cost option per metre at £18 sq. m, including vat. There is a Tile Cost Comparison / Estimator here. Click image below to download the latest prices. Q. Where are your tiles made? A. Mototile Seamless tiles and accessories and MotoMat Recycled are 100% UK manufactured. MotoLock tiles are EU manufactured. Q. Where can I see the tiles? A. We have a showroom and you can see us at popular Auto Sport venues throughout the year. Q. Is there a quick overview of Mototile? This short video explains Mototile products, how to order them and how to install them. Q. What is the availability/ lead time for delivery? Some items - in particular MotoLock Ramps - are made to order so we may need a little longer. Once your order is received we will phone to confirm all details. If an item is out of stock or needs to be made or machined we will inform you and confirm an exact delivery date, if the date is not suitable you can change your order or cancel at no charge. Generally orders for flooring are heavy and need to be shipped on a pallet: you must be there to receive, sign for and unload the pallet. Q. Can the floor be used straight away? Yes, unless curing time for adhesive is required (eg. for securing tile ramps), the entire floor can be used immediately it is laid. Q. Can I use jacks and stands on the tiles? MotoLock heavy duty tiles will take spot loads but for other tiles (eg Seamless) use a board under jacks or stands etc. A more widely spread load is safer to work with too. Q. What type of floors can Mototiles be laid on? The tiles can be laid onto any hard, level surface including concrete and wooden floors, ceramic tiled floors, linoleum and vinyl. However, they are not suitable for fitting directly over carpet or carpet tiles. Q. What do I need to do preparation wise? Usually very little. This varies somewhat with the tile type but none requires a perfect underfloor. View the installation guide for Mototile Seamless tiles. Basically remove any ridges or high points in the floor and fill any substantial cracks or holes with a self-leveling mortar. For tile ramps: When bonding tile ramps to a concrete floor observe the adhesive manufactures recommendations for surface preparation. For tile skirting: Ensure that you can get a good flush fit to the wall and that the bottom of the wall surrounding the tiles is clear of dust and debris. Q. Do I need special tools to install the Mototile system? No. Generally no specialist tools are required, although a non marking rubber mallet makes light work of fixing tiles together. You can buy one from us. Many installations require only a sharp knife for cutting the tiles, a tape measure and a straight edge. For curved or intricate shapes you can use an electric jig saw or a coping saw. The ramp and skirting products require a hand saw or electric jigsaw to achieve the best finish. There is an installation guide for Mototile Seamless tiles here: the same basic principles apply to the other tile ranges. Q. Can the tiles be cut easily? Tiles can be cut with the sort of hand or power tools you would normally use for cutting or shaping timber. The image below shows a cutout made using a jigsaw. Q. How do I install the Mototile snap fast flooring system? Like a very easy jigsaw. Or imagine laying carpet tiles that snap together and which you firm down with a rubber mallet. Here is a tile floor installation guide (PDF). Ensure a 3mm working gap is left around the edge of the garage / room and any fixtures so that tiles can be moved or altered in the future. The gap can be hidden by using our tile skirting. Here's a short slide show of a garage makeover. Sweep or vacuum the tiles then sponge mop them with a washing-up liquid solution: use the makers recommended hand-wash concentration level. Don't use harsh detergents, polishes or scouring powders. Never use abrasives. Q. What about environmental impact? Mototile interlocking tiles are 100% recyclable (we sell two ranges of tiles manufactured from recycled PVC materials) and are a totally reusable product: take them with you if you move. Also, if you damage a tile or two, you can replace them and not the whole floor, thus reducing waste. Q. Can I buy just one tile or a few tiles eg. to change a colour scheme? Yes. We sell all tiles, ramps and skirting individually and not by a set sized pack. Not unless the sale has been pre-arranged (apart from the Republic of Ireland). Delivery costs (shown in the shopping basket) are higher for all of Ireland and the Scottish Isles - reflecting the courier charges we have to pay. Q. Why are your tiles cheaper than some others, have you cut corners? Tiles are manufactured from high grade pvc materials to a full specification. Our prices reflect a focus on business essentials and careful cost control. Q. Is there a brochure I can download? Click the image to download a PDF brochure covering the full Mototile range. Q. What about customer testimonials? Here's a video sent to us from a customer's mobile phone. And there is a Garage Makeover Gallery with customer comments. Q. NEED HELP OR ADVICE? Please contact us prior to placing your orders. Phone 01329 841 416 (M-F 9 to 5) or fill in the enquiry form.